Jet lag comprises a constellation of symptoms that occurs as a result of disruptions of entrainment associated with time zone transitions. The jet lag symptoms include daytime fatigue, impaired alertness, insomnia, loss of appetite, poor psychomotor coordination, reduced cognitive skills, and depressed mood. The severity of jet lag symptoms depends on the number of time zones crossed as well as the direction of travel. Eastbound travel tends to cause difficulties in falling asleep, whereas westbound travel interferes with sleep maintenance. Clinical studies also indicate that jet lag can exacerbate existing affective disorders. It has been suggested that dysregulation of melatonin secretion and occurrence of circadian rhythm disturbances may be the common links which underlie jet lag and affective disorders. Melatonin has proven to be highly effective for treating the range of symptoms that accompany transmeridian air travel largely because of its regulatory effects on the circadian system. 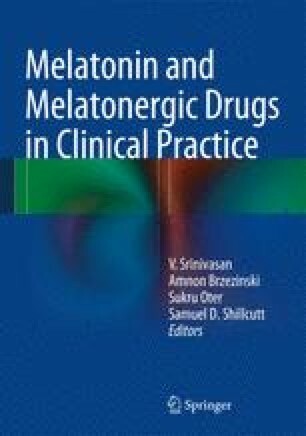 The therapeutic values of melatonin and its agonists such as ramelteon in reducing the jet lag symptoms and use of the melatonergic antidepressant, agomelatine, for jet lag-associated depressive disorders are discussed in this chapter.